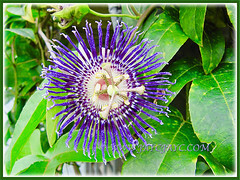 An extremely exotic climber or vine with beautiful flowers. It produces numerous edible fruits that are super refreshing and quenching, especially on hot days. Grow this beauty to enjoy its mesmerizing flowers, besides its fruits. 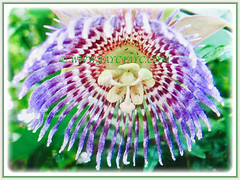 Botanical Name: Passiflora laurifolia (syn. 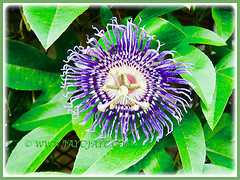 : Passiflora oblongfolia, Passiflora tinifolia). Common Names: Jamaican Honeysuckle, Golden Bellapple, Water Lemon, Yellow Granadilla. 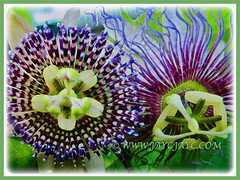 Etymology: The genus name, Passiflora, means Passion Flower in English. The name was instituted by the Spanish Christian missionaries to South America who interpreted various structures of the plant as symbolic of the last days of Jesus Christ and his crucifixion. The specific epithet, laurifolia means that the leaves resemble those of the laurel tree. Origin: Native to Southern America in the Caribbean, Northern South America and Western South America. It is also cultivated worldwide. Plant type: An ornamental and perennial climber or vine. 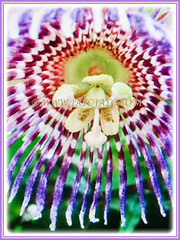 Features: Passiflora laurifolia is a species from the genus, Passiflora that consists of about 500 species of flowering plants. Its twining is more or less woody with wiry stems bearing slender and tough tendrils in the leaf axils flanked by 2 slim, green stipules. The evergreen, smooth, laurel-like and oval-shaped leaves are alternately arranged and have wavy leaf margin. It produces ornamental and fragrant flowers that are striped purple and white. 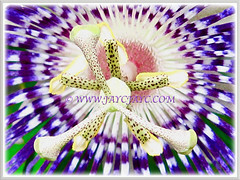 The flower is composed of 2 overlapping rows of long, thin petals with the inner one consisting of about 40 petals. The Water Lemon flowers open only in the afternoon and apparently are not self-pollinated. The flowers are pollinated by bees. Flowers will eventually be followed by smooth, orange-yellow fruits that are ovoid and shaped like a lemon. It is clasped at the base by 3 large, green, leaflike bracts, toothed and edged with conspicuous glands.The rind is leathery up to 3 mm thick, white and spongy within, becoming hard when dry. 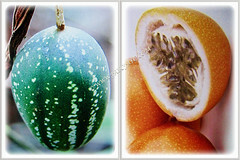 The medium-sized fruit is ellipsoidal or ovoid, 5-8 cm long and 4-6 cm wide. It starts off green-coloured and deepen to orange-yellow with extremely juicy pulp. The ripen fruit has an excellent mild, perfumed taste, without the tartness of the common Passionfruit. 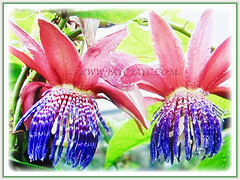 Culture (Care): Passiflora laurifolia or Jamaican Honeysuckle can be easily grown with minimum care. Light: Full sun to semi-shade. It produces more fruit under full sun. Moisture: Moderate water requirements. Water regularly, keeping it evenly moist especially during hot seasons. Others: Deadhead the flowers and trim off the withered/shrivelled leaves to keep it tidy. A hardy vine that can be pruned regularly to prevent haphazard growth, and to maintain good air circulation for plant health and productivity. Feed once fortnightly with a balanced fertilizer during active growth. It can be weedy or invasive in certain regions. Generally free from serious disease or pests. However, do watch out for caterpillars that feed on its leaves. For subtropical and temperate regions: Hardiness: USDA Zone 9b – 11. A tropical climber that is easy to grow in tropical and sub-tropical regions. It will not tolerate any frost, thus plant it in frost free areas. In non-hardy regions, grow them as an annual in containers to overwinter them indoors or in the greenhouse. Reduce watering during cooler temperatures, allowing soil to dry slightly between waterings. Propagation: Easily propagated from seeds or cuttings. 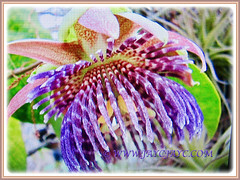 Usage: Passiflora laurifolia or Jamaican Honeysuckle with its ornamental flowers will be excellent as a landscape plant. It is ideal to cover and decorate garden fences, trellises, arbors, pergolas and arches. Suitable to be ground-grown. Grow the plant as it produces edible and refreshing fruits that are also used in drinks and beverages. In certain countries, it is being used as a traditional medicine, where the seeds have sedative action and in large doses are hypnotic. Even the roots and leaves are very potent vermifuge.